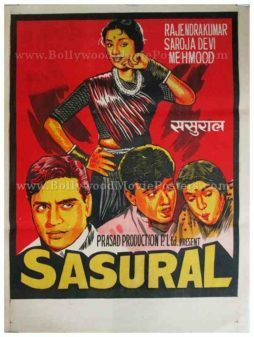 Old hand drawn Bollywood poster of the super hit romantic Hindi film, Suraj (1966) for sale. 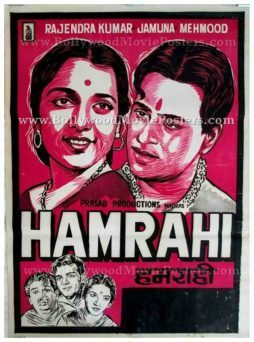 This is an actual surviving vintage publicity poster of the 1966 film that featured Vyjayanthimala and Rajendra Kumar in lead roles. 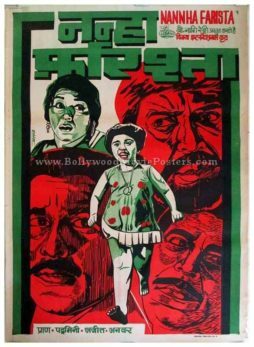 Printed and circulated several years after the first release of the film (somewhere in the 1980s), this old Bollywood movie poster was printed for publicity of the re-release of the film but never ended up being used. Suraj featured the hit Mohammed Rafi song, “Baharon phool barsao,” which is fondly remembered till today. This hand drawn old Bollywood poster capitalizes on the success of the song by announcing its lyrics on the top. This hand drawn Bollywood poster was originally designed in hand painted oil on canvas format by a small time art studio in Kolkata, making it highly collectible. Suraj (Sun) is a 1966 romantic Bollywood film starring Vyjayanthimala and Rajendra Kumar in the lead roles. Supporting cast includes Ajit, Mumtaz, Johnny Walker & Lalita Pawar. The film was a super hit success, becoming the second highest grossing film of 1966. Suraj was one of the last box office hits of Rajendra Kumar with actress Vyjayanthimala. Due to the consistent success of his films, Rajendra Kumar was nicknamed ‘Jubilee Kumar’. 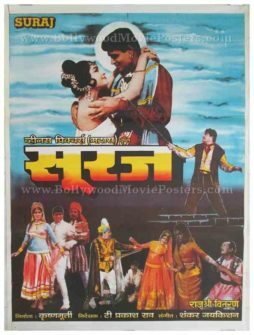 Bollywood movie poster of the super hit romantic Hindi film, Suraj (1966) for sale. 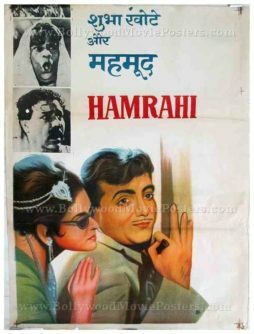 This is an actual surviving publicity poster of the 1966 film that featured Vyjayanthimala and Rajendra Kumar in lead roles. Suraj featured the hit Mohammed Rafi song, “Baharon phool barsao,” which is fondly remembered till today. Printed and circulated several years after the first release of the film (somewhere in the 1990s), this movie poster was printed for publicity of the re-release of the film but never ended up being used.